Our exclusive Aqua Cell® foam technology is the secret to our success. Made only in the USA, this exclusive formulation and custom molding process produces the world’s best quality closed-cell foam. Aqua Cell technology sets the standard in reliability, adaptability and attractiveness. Aqua Cell technology also provides superior performance in the areas of buoyancy, durability, cushioning, insulation and ease of cleaning. Aqua Cell is a durable, lightweight, closed-cell PVC foam that has extremely attractive thermal, chemical and physical properties that are viable solutions for a variety of applications. Latex-free: Aqua-Cell foam will not cause allergic reactions to those who are affected by materials containing latex. 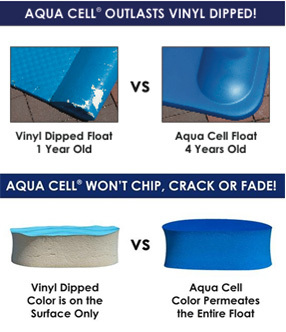 Not vinyl coated or Painted: Aqua-Cell color penetrates throughout the product and will not chip, flake or peel like ordinary foam products. U.V. / Weather Resistant: Aqua-Cell products are virtually unaffected by weather, chlorinated water and ultra-violet rays. Sanitary: Our closed-cell foam will not allow the build-up of mold, mildew or germ carrying bacteria commonly associated with other foam materials. F-Series: Our flexible series of foams are soft and resilient with excellent thermal properties compared to competing foams. R-Series: When compared to our competitors, our rigid foam series is stronger, harder and more durable. We understand that each opportunity is unique, that’s why we offer made-to-order solutions. Please contact us to discuss your needs by emailing sales@swimways.com or using the contact form below.